Comments: Subject to fungus leaf spots, aphids and spider mites. However, they will live and flower with little care. Plants may be mounding or tall growing. Flowers come in a variety of colors, shapes, sizes and types. 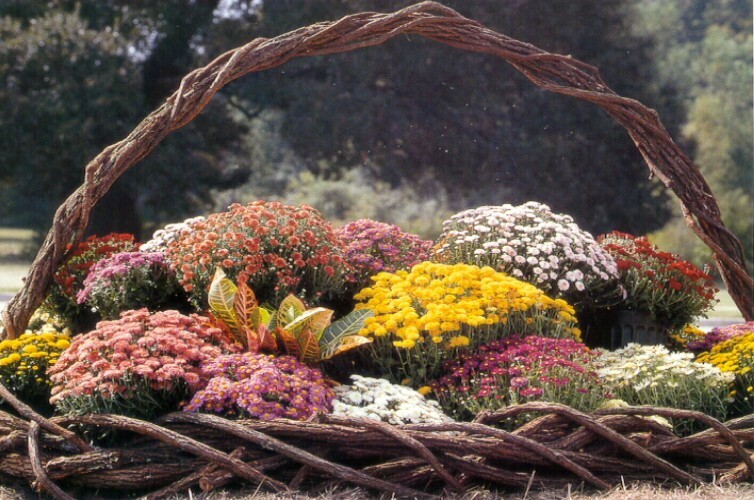 Mums are the queen flower of the autumn garden. Lift, divide, and plant side shoots of desirable cultivars in early spring to increase a good selection. Fertilize after new growth begins in early spring and several times during the summer because chrysanthemums are heavy feeders. To maintain a low mass or cushion form, cut back terminal growth shoots until about july 15 and then allow plants to grow until flowering. Stems will be shorter and hold flowers better with falling over under the weight of the flowers. Chrysanthemums are "short day" plants. Bud set and flowering are influenced by the length of the daylight hours, although varieties vary greatly as to their requirements.